In 1896, the American-backed Republic of Hawai‘i banned Hawaiian as the language of instruction in the schools. As island children were systematically punished for speaking Hawaiian, the number of native speakers dropped precipitously over the following century. Since the early 1980's, however, the effort to revive the language has grown. 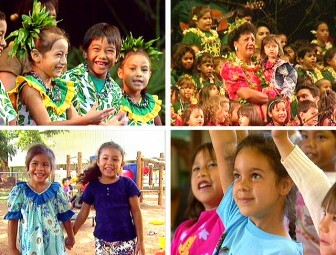 Today there are numerous Hawaiian language schools throughout the islands. This video presentation tells the story of how a small group of scholars and native speakers struggled to bring back the language that their ancestors were forced to give up. Larry Kimura, Ilei Beniamina, Kauanoe Kamana, Namaka Rawlins, Pila Wilson, Hokulani Cleeland, Joseph Mahiai, Elizabeth Kauahipaula, Opuulani Albino, Lolena Nicholas, Alohalani Housman, Bonnie Kahapea, Lilinoe Wong, Kahookele Crabbe, Nailima Gaison, Keonaona, Elama Kanahele, Kekoa Roback, Kiope Raymond. Narrated by Kalena Silva. Music by Keola Beamer. Produced by ‘Aha Pūnana Leo, Lilinoe Andrews, coordinating producer. Directed by Nā Maka o ka ‘Āina.